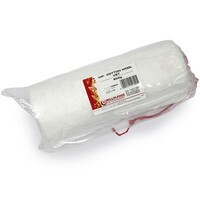 Millpledge Cotton Wool Vet is a soft and highly absorbent cotton wool blend for veterinary uses. This veterinary quality wool is made from 80% cotton and 20% viscose fibre blend to maximise absorbency, while still providing comfort and performance. This cotton wool is excellent to use as a padding bandage to provide cushion and support to the wound underneath the top layer bandage.